Description: A narrow opaque object will create a diffraction pattern that may be used to measure the width of the object. The diffraction pattern is like that of a narrow slit, with the width of the object replacing the slit width. You can try this with a fine wire or strand of your hair. Ask the professor if he/she wants to use their own hair, or have you pre fit it with a small stand. If the professors wants to use their hair, include some masking tape. If they want it pre fitted, cut a small thin opaque strand and tape it onto the magnetic slide holder. 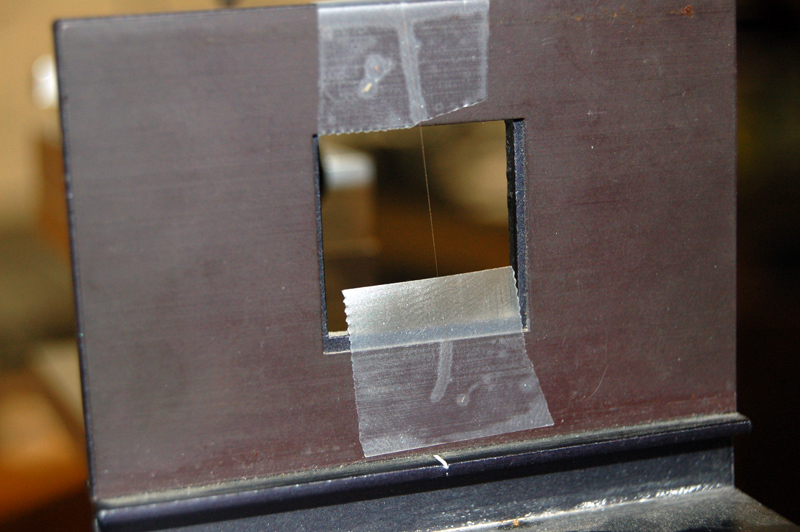 Place the magnetic slide holder onto the magnetic stand and align so the laser will shin on the string. If using your own hair, take a stand out and tape it onto the stand (see picture). Turn on the laser and make sure it's lined up on the thin wire/hair. Note the diffraction pattern on the screen is very similar to a single slit diffraction. (Optional) Take the appropiate measurments with the tape measure to calculate the width of the thin wire/hair.